Ancora perfettamente calati nello stato d'animo estivo, sembra lontana la preoccupazione per il guardaroba autunnale, ma resistere alla tentazione di una sessione di shopping di nuovi capi di tendenza per l'A/I 2016-17 pare davvero impossibile. Certo è che entrare a gamba tesa nella stagione fredda passando da costumi a cappotti in un batter d'occhio è un'opzione decisamente scartata, mentre adocchiare must "di transizione" si rivela sempre la soluzione migliore. Individuiamo allora 5 pezzi assolutamente trasversali e versatili che ci possano accompagnare dall'una all'altra temperatura strizzando l'occhio ai fil rouge visti sulle passerelle. 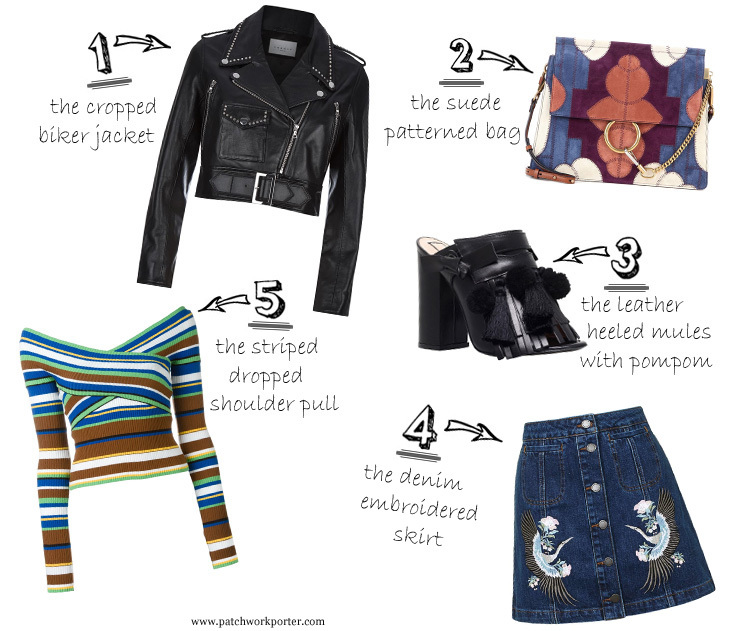 Sul podio rimane la giacca di pelle modello biker, che ora più che mai viene accorciata, rivisitata e arricchita con dettagli patch e metallici; segue la borsa d'ispirazione retrò, in suede e rigorosamente a pattern; a scoprire il tallone è poi l'ultra trendy scarpa sabot, ma guai dimenticare frange e pon pon. Come accantonare il denim?! Tessuto multiuso per eccellenza, eccolo in pole position su gonne corte o longuette, con bottoni o allacciatura a portafoglio, ancor più caratterizzante grazie a decori e applicazioni naïf. Ultimo, ma non per importanza, il maglioncino stretch che scopre leggermente le spalle in un tripudio di righe! It's been sweltering outside lately. And though we all know autumn is right around the corner, that fact doesn't really provide any solace. The new season doesn't bring with it an entirely new weekly weather lineup. There will still be days that break temperature records with spikes reaching the 90s. Then as soon as you decide you want to add a new warm weather piece to your wardrobe, the weather changes and the garment is rendered useless for another six months. It's the curse of the transitional season. But you don't have to give up warm weather shopping completely this year. With a few tips, you can buy clothes that are perfect no matter the season, as long as you're willing to invest in a few extra accessories. For starters, if you're tempted by the end-of-the-season sales on summer dresses, you're certainly not alone. Even though you'll probably only get away with wearing them for a few more weeks on their own, you can actually incorporate them into your fall wardrobe by adding a light jacket and a pair of leggings underneath. Of course, it takes the right kind of dress to pull off the transitional look. This designer dress collection highlights a few styles that you can utilize for the cold weather ensemble. A T-shirt dress, for example, is easily customisable. Leggings look great under a solid colour, bold print, or even the trendier tribal pattern that so many designers are favouring this season. And thanks to the design's popularity, it's easy to find one well within your budget, even if it's not on sale. Or, let's say you're tempted to add a cute jean skirt to your closet, but you're having trouble justifying the purchase. Well, you just slap your card down and buy those pretty shorts if you want. Thanks to the resurgence of '90s grunge fashion, you can easily throw on a pair of tights when the weather dips. And if you need some help coordinating with the, check out these style tips on wearing your favourite denim when things get chilly. "Loose denim shorts look very trendy with black tights," contributor Jessica Booth wrote. "Add ankle booties, a sweater, and a scarf, and you’re good to go." And finally, you can still wear your favorite tank tops and thin material tops with the simple addition of a knit sweater (remember the stripes and the off-shoulder style!). The layered tops look is popular trend this year, and this layering article highlighted several examples that you can easily recreate using pieces in your existing wardrobe. Then, wear a rock and gritty biker leather jacket and you're ready for any weather, from the end of Summer to the start of Autumn. Autumn is just around the corner, but that doesn't mean you have to stop enjoying your favourite summer wardrobe staples. With a few extra pieces, you can continue to wear them long after the cold weather arrives. So feel free to shop all the season-ending sales you can! Splendida selezione, bello il jacket!